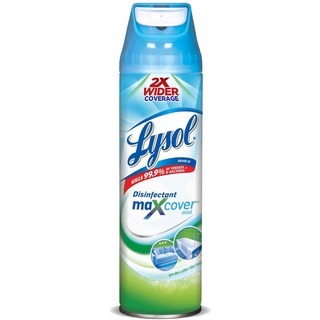 Lysol Disinfectant MaXcover kills 99.9 percent of bacteria and is approved to kill more germs than any other brand. This wide-angle mist helps to provide unbeatable bacterial protection to keep large surfaces like mattresses and curtains healthy and deodorized. Ultra-fine mist can uniformly reach crooks, crannies and crevices with no overwetting. Its fresh fragrance eliminates odors in fabrics to leave behind a surprisingly light, fresh scent. Simply spray on hard or soft surfaces for healthy, fresh surfaces every day. Use on mattresses, bedding, sofas, cushions, rugs, car upholstery, child seats, pet beds, clothing, bathtubs and patio furniture. Tuberculocidal, virucidal, fungicidal and bactericidal formula with Garden After the Rain scent is ideal for eliminating odors at their source. It is EPA-registered.